In today's post I'm sharing with you how I take care of my hair. Hair care is something that I started taking seriously three years ago. Three years ago I decided to go natural and rid my hair of perms. Best Decision Ever! 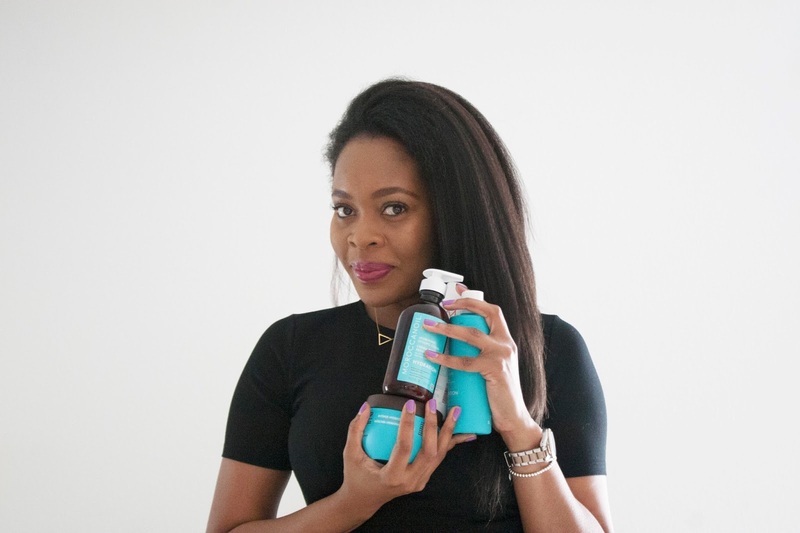 I'm very particular about what I use on my natural hair and when I learned about Moroccanoil hair care line, I quickly asked my sister (who has the most beautiful head of natural hair) if she had used them before. She gave me excellent reviews and then I decided to try them myself. After the humid summer we have had and the fact that I have neglected my hair due to traveling and projects, discovering Moroccan Oil has been exceptional and I really love that ALL of their products are infused with antioxidant-rich organ oil. I begin by soaking my hair in water and applying the Hydrating Shampoo which has so many good ingredients and none of the horrible sulfate stuff present in most shampoos. This one is super moisturizing and hydrating in every sense of the word. After rinsing the shampoo, I add the Hydrating Conditioner, I let it sit for 3 mins, detangle, and then rinse. I then pat dry my hair and added this Intense Hydrating Mask for about five minutes under my shower/steam cap. I rinse it and then comb and detangle my hair. By this time my hair is pretty manageable. I then add the Styling Cream and blow dry my hair. I could feel the amazing difference with this leave-in. I do not often use a single line when taking care of my hair. I generally mix products, but I could feel a major difference as I stuck to all Moroccanoil products to help add extensive moisture back to my hair. I haven't tried the Dry Shampoo as yet but I know it will be making it's way into my into my suitcase as I travel and a quick fix on days when I really need a clean. I would love for you all to share your hair care tips with me. Have you Tried Moroccanoil or will you try it?